Another one of Andy's requests for his many birthday celebrations was a chocolate chip cookie cake! We both grew up loving these, and I've always wanted to make one. I thought they were the most popular thing ever and was quite surprised that I didn't find many more recipes online. The icing I chose wasn't the texture I had hoped for, and I wouldn't recommend using it, so I won't include the recipe here. I was trying for an exact replica of the Mrs. Fields version we know and love, and this icing was a bit runny (does anyone out there have a Mrs. Fields frosting knockoff recipe to share?). Oh well, still awesome! The cookie is soft and fluffy, and a perfect blank canvas for decoration. Have you ever had a chocolate chip cookie cake? 1. Preheat oven to 350F. Beat butter and sugars together. Add eggs and vanilla and beat to combine. 2. In a separate bowl, mix together flour, salt, baking soda, and cream of tartar. Add dry ingredients to the batter and mix until well blended. Stir in chocolate chips. 3. Spread dough into a 15 1/2 inch round pan. Bake for 20 minutes. Let cool completely before decorating. Wow, crazy! First, it looks amazing. Second, so funny--I was looking at the Tollhouse Pie recipe I was telling you about, and I was like, "well this is almost the same!" Then I saw the piddling difference between 2 cups of flour in your recipe and 1/2 cup of flour in theirs. HA!! Anyway, when I was a kid, I would walk by the Mrs. Field's store at the mall and dream of getting one of those for my birthday. I don't think I ever told my mom, or else my dream might have had a chance at coming through! But I still see them and equate them with Cool Things I Couldn't Have, so consider yourself *VERY* lucky! ;-) I don't think I've ever tasted a giant chocolate chip cookie (at least, one that was actually baked all the way through)! I've actually never heard of a cake like this! But now I'm imagining how delicious it would be with three layers: Cookie, ice cream, cookie. I wonder if that would work! 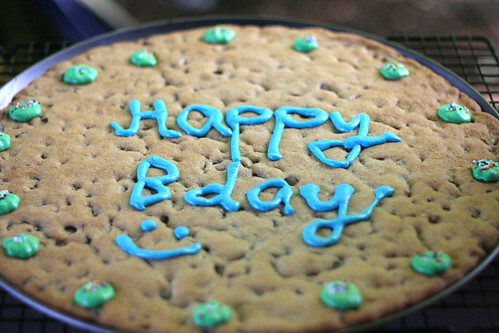 My parents would get me a cookie cake for every birthday when I was a kid! I love them! How cool!!! I bet it was yummy! Oh my god, I think this is the best idea I've ever heard! The invention of television and internet pales in comparison to a cake made of giant chocolate chip cookies - you have my respect, lady! it looks exactly like mrs. fields! awesome job. was it chewy too? Can you tell me how many servings it makes? @Unknown It depends on how you cut it. Maybe anywhere from 8 (big slices) to about 30 (little squares), but that's just a guesstimate. Enjoy! My son wanted a cookie cake for his birthday, so I Googled and found your recipe. It is in the oven right now, and I plan on using Martha Stewart's buttercream for the icing. The cookie dough tasted fantastic, so I'm hopeful that it all turns out!